June 13, 2013 - "New Product Release"
San Diego, CA – June 2013 – TDK Corporation has just announced the release of TDK-Lambda’s new CUS250LD series low profile AC-DC power supplies. These supplies are single-output and provide 250-watts of output power with convection cooling (no fans required). This unique design eliminates any need for fan maintenance while reducing acoustic noise and vibrations. Also, they feature a low profile of 1.18” and a compact footprint of 4.0” x 7.8”, which makes them the ideal choice for applications in light industrial, LED signage, communications, broadcast, gaming, point-of-sale, IT, and test and measurement equipment. The supplies operate from a universal input of 85-264Vac, 47-63Hz, with PFC, enabling them to be used anywhere in the world. In addition, they can operate from a 120-370Vdc input. 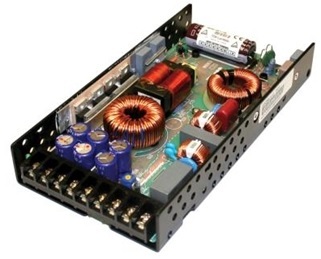 These units have an input- to-output withstand voltage of 3kVac. The CUS250LD series are available with an output voltage of 3.3V, 4.2V, 5V, 12V, or 24Vdc, all of which have a +/-10% user-adjustment range. The convection-cooled operating temperature range is from -25°C to +70°C with derating above +40°C. The power-saving efficiency is up to 90%. Additional standard features include overvoltage and overcurrent protections plus a green LED indicator that is lit when the supply is on. For more information about the CUS250LD, please call 1-800-LAMBDA-4, or visit the TDK-Lambda website.